Something has to give. Without enough horses, supplies, and reinforcements, Burgoyne decides to stock pile a 30-day supply and then cut off his supply chain from Canada. 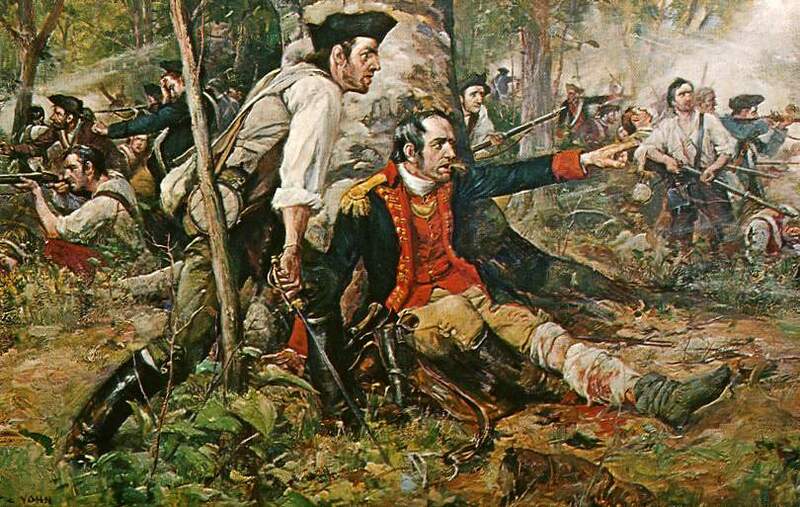 “Herkimer at the Battle of Oriskany.” Although wounded, General Nicholas Herkimer rallies the Tryon County militia at the Battle of Oriskany on August 6, 1777. Painting at the public library of Utica, New York. Barry St. Leger. Public Domain. Things were really unraveling for General Burgoyne in the early part of August 1777. On August 3, he received a letter from General William Howe letting Burgoyne know he was bound for Philadelphia and would not be reinforcing him in Albany. That same day, General Barry St. Leger began his siege on Fort Stanwix in western New York, which was occupied by Rebels. Burgoyne was in desperate need of horses, oxen, carts, and supplies, so that he could advance his troops south. He wanted to bring the Rebels to a quick and decisive battle so he could maintain the advantage he had gained by quickly chasing the Rebels from Ticonderoga. This would prevent them from entrenching their position between him and Albany and from forcing the British to divide their resources between the northern and western fronts of New York. He really needed St. Leger to take care of the Rebels at Fort Stanwix quickly, so he could come reinforce Burgoyne’s troops. But that was looking less and less likely. In addition, without the support of General Howe and his troops—what would have been the third prong to attack the Rebels in Albany—Burgoyne would need to bring his full force to push through the growing Rebel camp at Stillwater. However, his troops were greatly weakened. On top of everything else taking place, Burgoyne’s troops had to defend their supply-line, which extended all the way back to Canada. The solution was to get horses and oxen to hasten the movement of the supplies and take what he could from the Rebels, so he could stockpile 30-day supply in Fort Edward and then cut off what had become a debilitating supply-line. For this reason, the expedition to Bennington, Vermont, now took on even greater importance. The plan was to raid what was believed to be a scantily-guarded Rebel depot in Bennington to get supplies, horses, and oxen. With this, Burgoyne would then have his full force to put the squeeze on the Rebels and get to Albany. Near the intersection of Route 4 and Patterson Road, south of the Village of Fort Edward, is a historical marker that identifies the location of Rebel General Philip Schuyler’s Campy. The Rebels occupied this position with approximately 1,500 soldiers and assisted the troops retreating from Fort Ann. They maintained this forward position as a base for harassing Burgoyne’s troops to the north, but when the forefront of Burgoyne’s army arrived in Fort Edward in late July they abandoned it. Benedict Arnold was here briefly before being dispatched to help relieve St. Leger’s siege on Fort Stanwix. Rebels at Stanwix destroyed St. Leger’s camp and supplies. 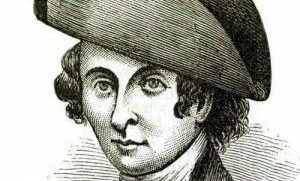 When the Indians learned that Benedict Arnold was on his way with more Rebel soldiers to relieve Stanwix, they fled, forcing St. Leger to withdraw and end his planned campaign to Albany. Start Track 24 after leaving the Old Fort House Museum. You will see the Hudson River on your right.